Even more remarkable than the long list of monikers is that although this tree is one of our most beautiful native trees, few people have the slightest idea what it looks like. I can understand why people cannot identify this tree in summer, fall or winter: During these seasons it is truly a tree that lacks easily distinguishing features. However, that is not the case in late spring. At this time of year, the grancy graybeard’s unique beauty and the perfume from its unusual flowers make it a woodland standout. 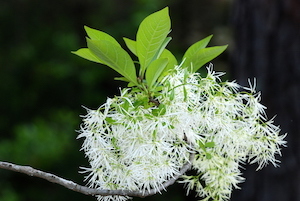 Since it is not as common as it once was, you may not have seen fringe tree. However, once you do, you will agree it is unlike any other flowering tree in our corner of the world. This species is small, ranging from 10 to 30 feet in height (although all I have seen have been 15 feet or shorter). Before the tree's oblong leaves emerge, its magnificent blossoms appear. When in bloom, the fringe tree appears to be decorated with clusters of delicate white lace. This visual effect is created by slender flowers comprised of flowers formed by four petals, each up to an inch long and 1/16th of an inch wide. Oddly, the flowers of male trees are large than those on the female. If the sight is not enough to catch your attention, the fragrance emitted by these flowers will. When in full bloom—the grancy graybeard is among the last native flowering trees to bloom in the Peach State each spring—the delicate, sweet scent of the flowers wafts throughout the woodlands. The scent carries many feet away from the tree. These unique blooms attract a variety of insects, from tiny beetles to native bees and butterflies. Although I have not seen many butterflies nectar on the tree's blooms, among those that I have seen on grancy graybeard blooms in my back yard is the beautiful juniper hairstreak. As the petals fall, the ground beneath the tree appears to be covered with shredded coconut. Once the petals have all fallen, the tree once again dons its cloak of anonymity. While we may lose track of these trees until the next spring, they are not forgotten by our wildlife neighbors. It seems that later in the year female trees bear a crop of blackish-blue fruit that never fails to attract birds, such as blue jays, wild turkeys, mockingbirds and cardinals. In addition, deer will browse on the leaves and twigs. Fringe tree also is the host plant for one of our most striking moths, the rustic sphinx. The medicinal value of grancy graybeard was known to Native Americans. These first human residents of North America used juice from the tree to treat wounds, skin irritations and bruises. When medicine became scarce during the Civil War, Confederate doctor Francis Porcher wrote that he used parts of the fringe tree to make medicines he administered to soldiers suffering from various ailments. None other than George Washington thought so much of the tree planted it in his gardens at Mount Vernon. In the wild, you are most likely to find fringe tree growing in open, moist woods. However, the tree has demonstrated its ability to survive in dry upland areas, including as my yard. Horticulturalists consider fringe tree one of the most trouble-free trees homeowners can plant in their yards. One would think that this trait, coupled with the tree’s stunning spring foliage, would make it popular backyard planting. But this has not proven to be the case. For example, as far as I know no one else in my neighborhood has a grancy graybeard growing in their yard. However, I firmly believe this situation will change when folks begin seeing a few fringe trees blooming in yards across the state. Once people see them, I’m convinced they will be smitten by this small, native tree. Why not be the first in your neighborhood to set out a grancy graybeard? You might encourage your neighbors to do likewise. If so, all—including your wildlife neighbors—will benefit.